On Stage Lighting has a beginner’s guide to media servers, digital lighting and some extra skills that could become vital for future stage lighting technicians. Plus, are us lampies now betrothed to the video department? Or will we never actually get up the aisle? If you watch TV shows, rock concerts or big gigs like an Olympic Opening Ceremony, you see some pretty impressive lighting effects. In the background, scenic elements become walls of moving images, LED matrices throb with funky colours and text. It’s all part of the brave new world – Digital Lighting. The idea of using stage lighting and video projection techniques isn’t new but the systems used are becoming more complex and the boundaries between lighting and vision are being blurred. It’s even got a fancy name – Convergence: the convergance of digital media, projection and lighting technologies. More about that later. “Digital lighting”, using digital media in lighting, refers to a couple of different technologies and applications. Digital Projection – Using projector technology to throw light with patterns, colours and imagery. This only differs from standard projection in it’s purpose – to create looks, mood and to light a space with digital media. Screens and digital array systems – Using LEDs and other pixel light sources to create a screen to replay digital content. 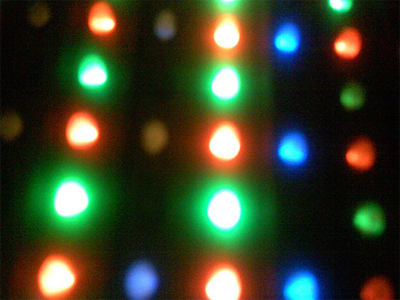 A simple array could be a 3 x 3 grid of pars or a more complex flown cloth with a high resolution grid of 3 colour LEDs. This is where the definitions really get stretched – are “screens” really lighting? Well, it’s all part of the visual experience. Media/Content – to screen or project media in a digital lighting system, you need content. Pictures, clips, algorithms to render. Media Playback – servers, players, anything that organises digital content pixels and sends them down a wire. Control Surface – The lighting console in many cases, a method to choose, blend and send the digital content. In lighting, we still think of these as cues (for the moment). Control System – The method for the different digital elements to talk to each other. DMX or a network protocol. Output Devices – Digital projectors, lighting fixtures or arrays/screens. The stuff at the end of the line where it all happens. AKA Producer Pleasers. What is a Media Server ? A media server is any device that produces or plays back content for our projection/lighting fixtures. At the bottom end of the scale we have a single laptop running a Windows screen saver, while top notch media systems might consist of racks of dedicated computing power rendering layers of content to a whole bunch of output devices.Hardware media servers ( the big ones in racks) like Axon (often outputting the the High End DL moving head projectors), Hippotizer and Pandora’s Box. Other software based players can be run on a decent laptop and include brands like Arkaos VJ or Grand MA Video. Hell, you can even use Winamp. How do lighting consoles control a media server? DMX512 is still pretty entrenched in stage lighting today and it is possible to control the media content using simple DMX signals. Media control layers have a fixture personality and different parameters or selection values. Layer 1 : Intensity 100%, Playlist 1, Item 4, Play, Loop – each DMX channel has an attribute and a value. Media thumbnails and other tools that aid control. Control from the device, as well as control via the desk. This is fed back and can be recorded at the console. Content can be sent to digital lighting devices using a video signal – VGA, Component, Composite. One media server output = 1 piece of projection content. If you need two fixtures to do different things, you need more than one server output. Digital moving lights such at the High End DL have Pan, Tilt, focus, iris and other “standard” lighting functions as well as projector-like controls. The DL also has onboard media serving facilities that are controlled using a laptop utility, effectively uploading your custom gobos/other wobbly stuff to the fixtures playback system. But I don’t want to be a Vidiot! A straw poll of lampies and video engineers around me suggests that none of us feel very “converged”. There nothing much converging about digital lighting – it’s the lighting department nicking technology from the VT boys for our own personal gratification. The idea of being able to create gobos in Photoshop, animate swirly patterns and play back videos to light the stage with is too good an opportunity to miss. Let’s face it, no one in the video department really appreciates a well focussed DHA leafy break up gobo. That’s what makes us lampies! Let just borrow their kit. What Skills Do I Need For All This? Ok, so you are busting to get out there and learn every bit of kit you can get your hands on. That’s great. In the meantime, there are a number of related skills that a stage lighting technician needs. Many of them are already part of the modern world, particularly for anyone who uses IT ( ie nearly everone). The basic optics of projection. Like lighting optics with more emphasis on focus and keystoning. Digital file types and organisation. Understanding how digital pictures and movies are compressed and displayed – it’s all pretty simple for the Bebo generation. Understanding of pixels, rasters and resolutions. PC screens or projectors. This is also a part of successful pixel mapping. Basic networking knowledge. Doesn’t have to mean your brain has it’s own IP address – just enough understanding of how devices interact with each other. Using layers and masks. Learn something like Photoshop. As well as being able to produce your media server content, the concepts of such software are used in media server content organisation. Layers, opacity, vector masks and alpha channels plus using RGB or HSB colour mixing. Much as I hate to be a Vidiot, the basics of the dreaded world of VT. Signal types and distribution, switchers, frame rates. Understanding these mundane things sets the Lighting Designer free to create, making informed choices based on the technology available. LD’s like Richard Pilbrow have always kept ahead of technology, using it for their purposes while remembering the basics of lighting a show. So, where do you stand on the whole “convergence” thing? Are screens really a job for the lighting department? Are we all just one big happy family or is there a limit to how integrated you think LX and VT will be? Personally, any technology I can use to good effect is fair game but what are your thoughts? Let us know in the comments box as usual. See you next time. Hi, would you please be able to help me with figuring out a stage light? I am the captain of a dance team in my school and know NOTHING about lighting and have a performance this weekend. I came across your blog and thought you may be able to help..
Would you know what the lighting at 1:41 in the link below is?? Hi Shay, looks like a gobo wash or some other projected textures, shining from above. I’m all for a bit of convergence, but it needs to be affordable otherwise I’m not gonna get to play with any of it until I’m on the job, I currently get to play with Lights and Pearl’s amoung other things, as a Member of Backstage Society at Leeds Uni, and working in events, but all this media server stuff is expensive!